Take a look at some of these simple rubber stamped cards for inspiration for new stamping projects. These cards are easy to adapt for a wide variety of uses and occasions. A well placed embellishment such as this tiny ball of yarn can give a unique finish to a card. 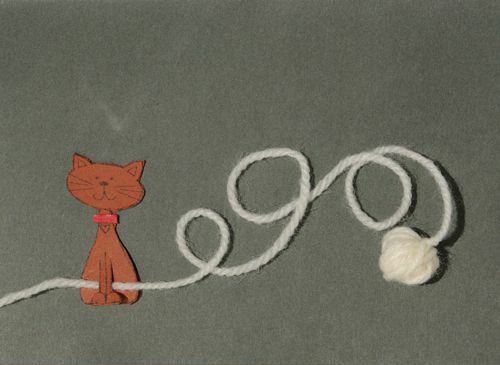 This card is decorated with a cat holding the end of a ball of yarn. The stamped image of the cat has been carefully cut out of card. Small cuts have been made up his legs to hold the end of the tiny ball of yarn. This idea could be adapted in a variety of ways - kittens, puppies and other animals can all be given extra character with a few well placed embellishments. Tissue paper 'seaweed' adds interest to this card. The fish on this card are swimming through fronds of 'seaweed' which has been cut from tissue paper. The rubber stamped fish images have been colored and cut out from card stock and were assembled on the card in between the strands of tissue paper. This technique adapts to a variety of other designs - instead of 'seaweed', tissue paper grass could be home for rubber stamped butterflies, insects or other small animals. An all over effect can be achieved through the repeated and regular stamping of an image. All over designs are simple to create by repeatedly stamping images onto a card in a regular pattern. These can be embossed and colored in a variety of ways to produce different effects. The card in the photograph has been colored with watercolor paints. The dark card used in this project gives a dramatic contrast to the colored images. A very different would be achieved by working on a light background with a clear or pastel embossing powder. Simple designs can be created with just a stamp pad! Ink pads can be stamped onto paper to create shapes. Cat's eye shaped ink pads are ideal for making the shape of flower petals. This is a quick and easy way to decorate a card when the perfect stamp is not to hand! A glue dot was placed in the center of the flower and small glass beads were pressed into the surface to give a raised focal point. Ink pads can also be used to create backgrounds for stamping projects, for instance by rubbing an ink pad over crumpled paper to give a distressed effect, or repeatedly stamped to build up blocks of color. Wet paper casting is a fun way to create cards with an added dimension. The simple technique of wet paper casting (otherwise known as wet embossing) is easily adaptable and can be used for many occasions. A light dusting of chalks or pigment powders will add further depth and interest to the images. This versatile technique is ideal for producing elegant cards. When images are stamped using a clear embossing ink and rubbed over with chalk, subtle patterns are created. This is ideal for creating an all over design for a handmade card or for adding a single point of interest. One simple technique can be adapted in many ways. Stamping on paper or card shapes is a great way to add dimension and interest to a card. The same technique can be used in many ways and different effects are achieved by placing the images regularly or in a random fashion. This is also a good way to use up odds and ends of paper and cardstock. Printing text from a computer can be the ideal way to create a sentiment or greeting when the perfect stamp is not available. Although, in an ideal world, there would be the perfect stamp for every occasion, sometimes it is simply impossible. Printing text from a computer is the ideal way to add relevant text. This can be blended into the project using simple techniques such as coloring the edges of paper in a complementary colored ink. Origami can be an interesting way to bring an added dimension to rubber stamping projects. Paper crafts such as origami and rubber stamping go well together. The origami tie in this card makes an interesting alternative for a greeting card for a man. Other ways of using rubber stamping and origami include using rubber stamps to create your own unique origami papers. Stamp and decorate the paper using your favorite techniques before folding. Cutting stamped images from paper or cardstock and applying these to greeting card blanks is an ideal way to create great looking cards quickly. Simple cards like the card in the picture are quick to create yet the results look highly professional. Stamped and colored images can be cut out and applied to card blanks to create cards for many different occasions. The benefit of applying the cut out images to a greeting card is that there is no risk of a misplaced or badly stamped image spoiling the finished card. This is also a great way to use up odds and ends of paper and cardstock. This card layout is simple to adapt. Tell your own story by combining rubber stamps! Combine different stamped images to create your own designs or stories. The fish in this card is dreaming of fish, however any number of images can be combined to create unusual or surreal designs. This card also features a background panel made from bubble printed paper. This is a great way to get maximum use from your stamp collection. Creating your own background papers and panels is simple to do and is the perfect way to produce unique cards. Making your own background panels for stamping projects helps to create wonderful and unusual finished results. This card has been created using the chalk shaving background technique combined with a simple stamped sentiment.